Today i bring you another culinary delight from the seven sisters state Arunachal Pradesh. While googling recipes of these states, i as a vegetarian was baffled!!! There was very little vegetarian recipes to try, every recipe had some kind of meat. Accepting my defeat, I went on to make Momos, which can be found all along the North-eastern india, extending upto our neighbhour China. It came out so bad, forget posting, couldn't even look at it!!! This failure made me to read more about our sister states.Since it is mostly hilly area and are dominated by tribes, i started searching with respect to the tribes. I happene to stumble upon a journal by CSIR - NISCAIR, Council of Scientific and Industrial Research on Monpa Tribes of Arunachal pradesh. Arunachal Pradesh is considered one of the richest botanical regions in India, where people depend much on shifting cultivation and forest based food products for their food and nutritional security. Monpa tribe consumes a range of solid, semi-fermented, fermented, boiled and process food apart from the rich and medicinally important beverages prepared from indigenous maize, barley, finger millet and rice varieties. A diverse knowledge system exists among Monpa women to prepare the daily meal, which is gathered by various trial and error methods over a period of time. I was talking about Momos, which is very popular, is actually made using bong/barley flour, and stuffed with vegetables or meat.But what we do now, we use maida to prepare the same, which is totally skimmed out of all nutrients. Bundangmo,it is nothing but Amarnathus/Amarnath or the humble Rajgira a precious crop for monpa tribe, but the journal says that the cultivation has reduced over the years and now can be found only in remote villages. They prepare something called Khapse and Gasinpipi with amarnath flour. The grains are first dried, roasted and made into a flour. The flour kneaded with warm water and made into a 8-shaped rolls and deep fried in mustard oil. This khapse is stored in bamboo container for a year. 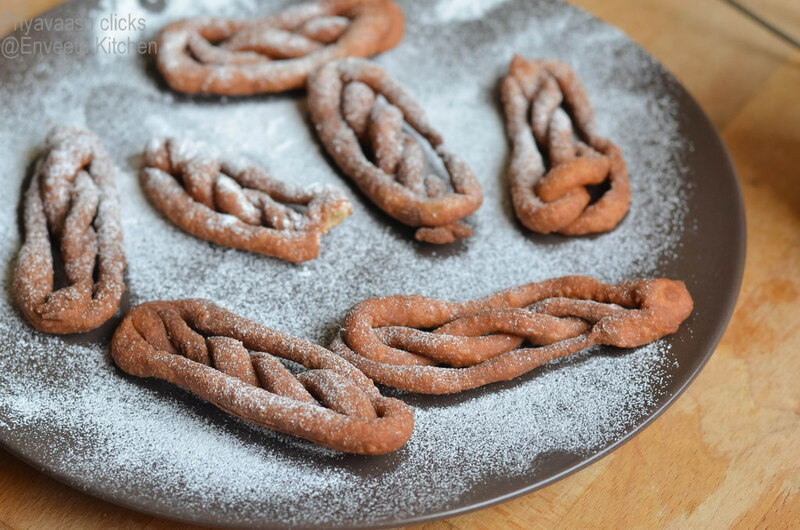 The same flour is kneaded and rolled into a chapathi and cut into star shape, partially dried in bamboo mat, these are then roasted without oil and called as gasinpipi. Sadly the present generation of Monpa are slowly forgetting their traditional food, thanks to modernisation and introduction of commercially processed food. I was so happy and considered myself blessed to atleast read this information. I decided to make khapse from Arunchal pradesh. This Khapse is made during Losar Festival. Losar or The New Year festival, is the most important festival of Tawang District in Arunachal Pradesh. The Monpa Tribe celebrate this as the coming of a New Year. The festival generally lasts for eight to fifteen days and is celebrated with loads of fun and festivity. During the festival days, festivities prayers are offered for prosperity and good. While googling for the recipe i came across this recipe with Maida, but then i have made required adjustments and made it as traditional as possible. Mix Warm water, milk, sugar and oil together. Take the flour in a big bowl, add the liquid little by little and start making a soft pilable dough.Let the dough rest for 10 minutes. Divide the dough into 3 balls. Dust the rolling surface with flour, roll out each ball 1/4 inch thickness. 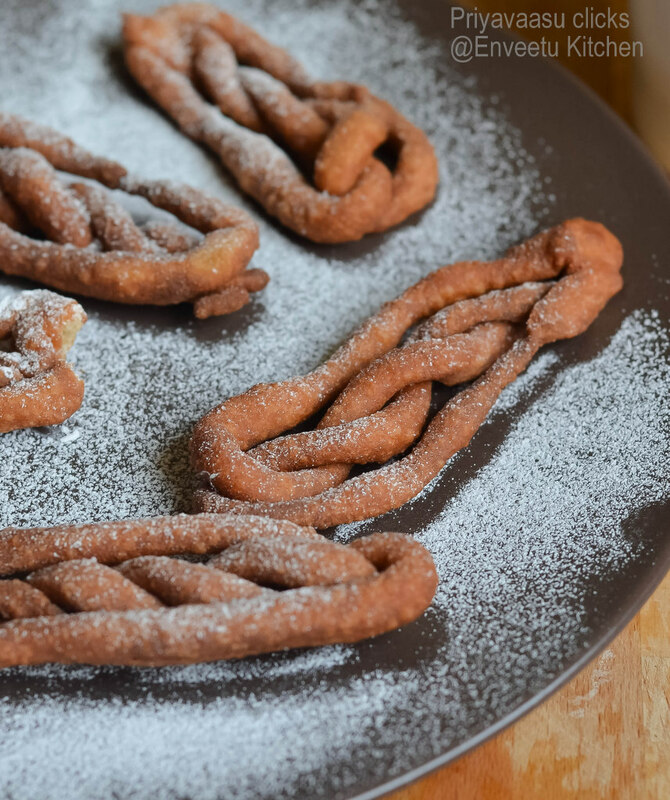 Cut the dough into strips and roll each strip into a rope and shape it as shown. This shape of khapse is called buri. Repeat the same with the rest of the dough.Please follow the video for the shapes. Heat oil in a kadai/pan for frying. Keep the flame in medium. This is very important. Coz the fritters browns pretty fast, so if the flame is high you will end up with soft fritters. Keep the flame medium, Deep fry the fritters in batches, do not crowd the pan. Once they are fried well, the sizzling of oil will cease, then take the fritters out of the oil and drain them well on a kitchen towel. While serving, dust the fritters with powdered sugar and serve. Store the khapse in air-tight container. Both my hubby and my lil one enjoyed them well, the elder one was a bit hesistant to try because of the unique taste/flavor of amarnath flour. Wow! nice fritters. Bookmarking it..
that is surely a winner!!! so perfectly done!! 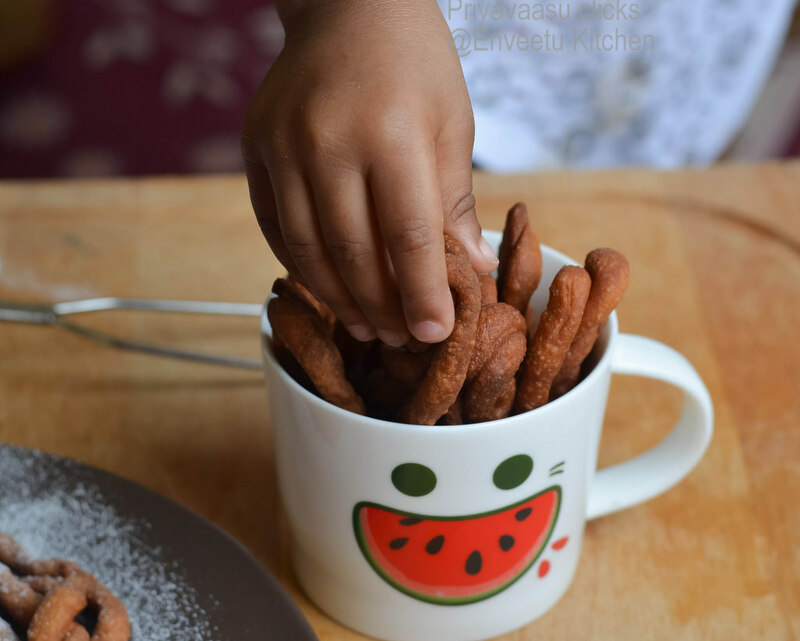 Love the healthy twist you have given here Priya, interesting fritters with amarnath flour..would love to munch some. 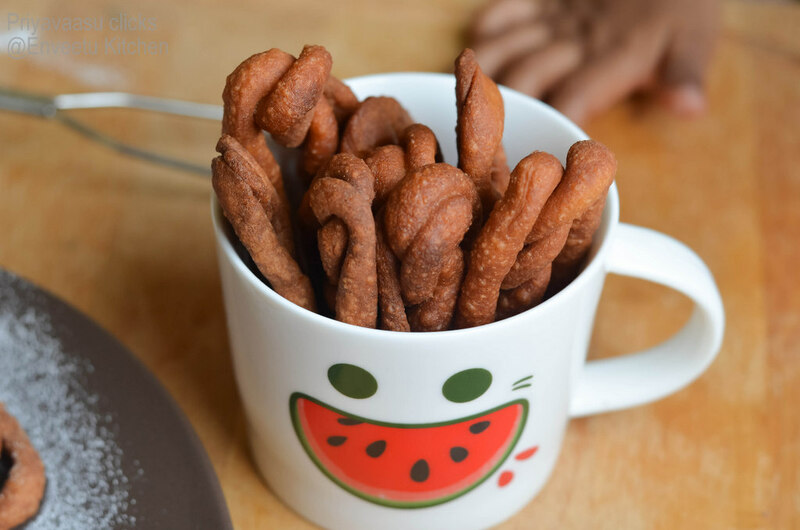 Good that you changed the flour..and made it even more healthy!..my kids loved it and disappeared within mins! Loved the detailed research that you did. And you stuck to the original.. great work. Lovely pictures. You are a intelligent student and have got some great information. .:)) truly the search of the cuisine of these sister states has been a job.Very interesting write up. 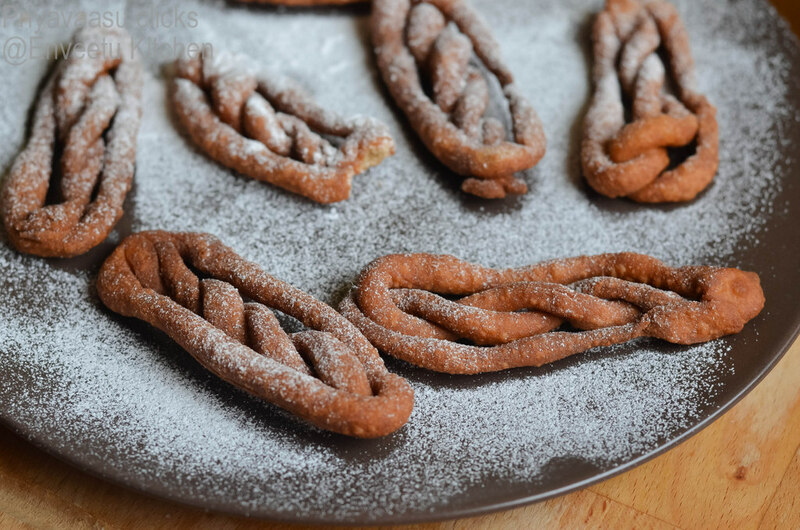 These look like pretzels. .wonderful. Love this healthy version of khapse ...bookmarked ! Very inviting recipe Priya..never tried the amaranth flour,love the shape of the khapse.. Enjoyed reading all the information that you have gathered and presented so well. The khapse look great. Very informative post Priya. Khapse look great. Lovely clicks. Wow.. they look so tempting & yum. Healthy and beautiful..What to say more than that..
You made these Khapse the healthy way. Very nice. These look very inviting with that sugar dusting.